I'm thinking about pushing the boat out and getting myself a "netbook" and was wondering whether I'd actually find the relatively low resolutions they offer usable so I knocked up this quick comparison. To make them as usable a possible you'd probably have your browser in full screen mode so that's what I've depicted here. As you can see both the greater resolutions would be very usable for browsing and the Mini-Note's resolution is brilliant for a 9" screen; being the same as that you usually see on much larger machines. 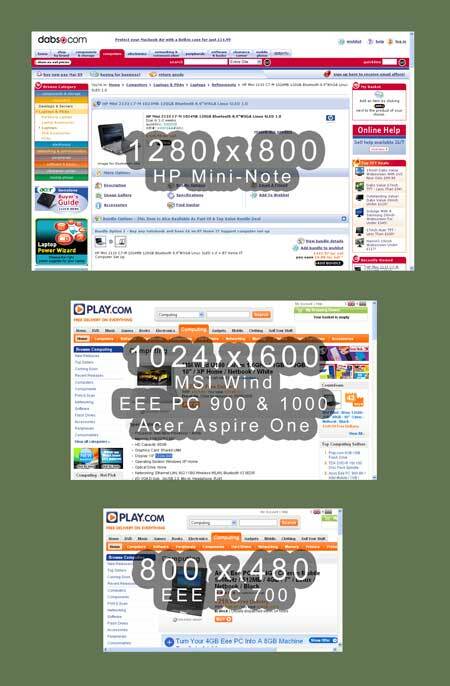 The 7" EEE PC's 800 x 480 resolution isn't quite enough. You can see in the screen shot the horizontal scroll bar at the bottom and I think that would be a common problem as lots of sites are designed for 1024 pixels as minimum width rather than 800 pixels these days. To sum up the HP would almost be a viable alternative to a full size laptop if it were more powerful. For now though, it looks like the Acer Aspire One with its good resolution, 1.6GHz Intel Atom processor and excellent price of £199, would be the best one to go for. Derek is a massive geek who enjoys programming computers and watching science fiction television shows. Currently working as a Developer at Trainline in London.